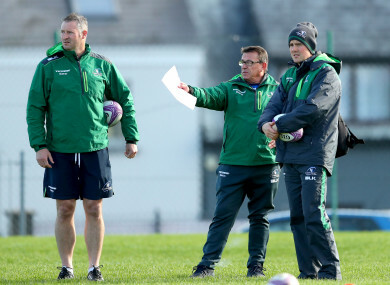 NEW CONNACHT COACH Kieran Keane is relishing his his first home inter-pro derby tomorrow night against Munster. The New Zealander, who arrived in Galway in late August to take charge of Connacht, said he knew the derby games had a special place in Irish rugby. And while his first experience of one was a 16-8 loss away to Ulster before the European window, Keane said he appreciates the importance of the derby games and has noticed how players look forward to them as well. “They all want to play in them and I’m as excited as much by the occasion as the players are. His side go into tomorrow’s clash on the back of two encouraging wins having won 43-15 away to Oyonnax in Geneva and then backing it up with a 15-8 success against Worcester Warriors at the Sportsground last weekend. But Keane knows they need to start picking up points in the Pro14. They have lost all three away matches to Dragons, Scarlets and Ulster and their only win in the competition was a 32-10 success over a Southern Kings side who have struggled since joining the competition. Connacht have lost two of their three home games and Keane said he is hopeful they can learn from their mistakes and carry their European form into the Munster game and another home clash against the Cheetahs next weekend. “We have gone back as we tend to do in reviews and looked at things in collaboration with the players. We have had some really good constructive dialogue around what we are trying to achieve and how we are going about it. He has rotated his team to try keep players as fresh as possible but a concern has been how a good display has not been backed up and that’s something he’s trying to rectify. “That’s the million-dollar question. That’s happened a couple of times but personally I think we have addressed some of the issues. We don’t want to divulge how and why we do things, but I am satisfied. Email “Keane relishing inter-pro on home soil after back-to-back wins boost the form book”. Feedback on “Keane relishing inter-pro on home soil after back-to-back wins boost the form book”.